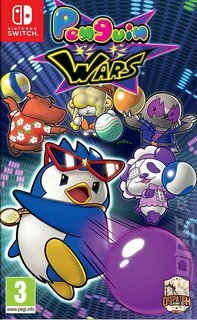 The classic rule of using 10 balls to throw at each other is still the core of Penguin Wars. However, now you can evolve your characters in Story Mode and use those suped up characters in both local and online game play against your friends. This release also introduces multiple sets of new rules, which new and seasoned gamers can both enjoy. Music from the original version released in 1985 has been remixed and updated by notable musicians from Japan, which will make you want to listen to the music while you re out for a run or dance to on a Friday night with the family. Story Mode: Join Riley and his friends on their journey to Gira Gira land. Collect items and earn candy to evolve your favorite character. You can also buy Gira Skills that let you learn special moves for each character. You can play one on one, two on two, or even play with different rules such as using bombs and other items against your opponents. Each character has a different skill set so make sure to use and master appropriate characters to help you on your journey. VS Mode (Local): On Nintendo Switch, pick your characters and a set of rules to play with a max of 4 people. Tabletop mode allows players to play while standing in front of each other like the good ole arcade days. VS Mode (Online): Play against people in Gira Gira land or you can match up directly with friends. Use characters that you ve evolved in the story mode and see who comes out on top.